THE UNDERSIGNED, HEREIN CALLED “RENTER”, WHETHER ONE OR MORE, DOES JOINTLY AND SEVERALLY HEREBY RENT FROM THE RENTAL COMPANY, HEREIN CALLED “OWNER”, THE DESCRIBED PERSONAL PROPERTY ON EQUIPMENT RENTAL FORM, HEREIN CALLED “PROPERTY”, AT THE RENTAL RATES SET FORTH BELOW. Products must be returned with all accessories and parts intact and in proper working order. Renter is fully responsible for the loss; theft or destruction of said property from all causes whatever and agrees to pay the owner the fair market value of the property in such event. In the event of damage and/or partial destruction from any cause whatever, renter agrees to pay to the owner a reasonable cost of repair to said property. Failure to return property at the agreed date and time will result in an additional service charges plus all additional rent for the extended period. All orders require prepayment with credit card. This credit card will be used for any equipment damages. Renter will be notified prior to damage charges. 72 hour cancellation notice is required. Cancellation made within 72 hours of scheduled delivery will be charged at 50% of order. Delivery is free island wide. All fees and prices are subject to change between one order and the next. Nana’s Equipment Rental accepts all major credit cards and cash. All customers must read Rental Agreement/Liability Waiver prior to time of delivery. 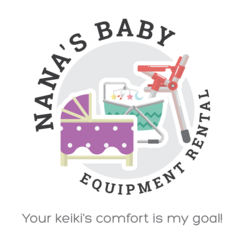 Payment of equipment rental invoice from Nana's Baby Equipment Rentals is considered acceptance and signature of the Rental Agreement and Terms of Liability. In consideration of the rental agreement between myself, and Nana’s Baby Equipment Rental, I acknowledge and agree to these terms. I understand that there exist certain risks of injury from the use or misuse of such items, including the potential risk of serious injury, disability or death from the use of such items. I understand the risks associated with the use of such items and understand the safety concerns regarding the items. I, for myself and on behalf of my heirs, assigns, personal representatives and next of kin, hereby release, hold harmless, and agree not to sue Nana’s Baby Equipment Rental, the lesser of all such items I have agreed to rent, their officers, agents and employees, with respect to any and all injury, disability, death or loss or damage to person or property, whether caused by the negligence of the negligence of the lesser or otherwise. I further agree that this release of liability shall be governed by the laws of the State of Hawai’i. I have read and understand this release of liability and fully understand its terms and I fully understand that I have given up substantial rights by freely and voluntarily without inducement. Payment of equipment rental invoice from Nana's Baby Equipment Rentals is considered acceptance and signature of the above rental agreement/terms of liability.